Traditional or primitive rafts are constructed of wood or reeds. Modern rafts may also use pontoons, drums, or extruded polystyrene blocks. Inflatable rafts use durable, multi-layered rubberized fabrics. Depending on its use and size, it may have a superstructure, masts, or rudders. Timber rafting is used by the logging industry for the transportation of logs, by tying them together into rafts, and drifting or pulling them down a river. This method was very common up until the middle of the 20th century but is now used only rarely. The type of raft used for recreational rafting is almost exclusively an inflatable boat, manufactured of flexible materials for use on whitewater. The modern raft is an inflatable boat, consisting of very durable, multi-layered rubberized or vinyl fabrics with several independent air chambers. The length varies between 3.5 m (11 ft) and 6 m (20 ft), the width between 1.8 m (6 ft) and 2.5 m (8 ft). The exception to this size rule is usually the packraft, which is designed as a portable single-person raft and may be as small as 1.5 metres (4.9 ft) long and weigh as little as 4 pounds (1.8 kg). Rafts come in a few different forms. In Europe, the most common is the symmetrical raft steered with a paddle at the stern. Other types are the asymmetrical, rudder-controlled raft and the symmetrical raft with central helm (oars). Rafts are usually propelled with ordinary paddles and typically hold 4 to 12 persons. In Russia, rafts are often hand made and are often a catamaran style with two inflatable tubes attached to a frame. Pairs of paddlers navigate on these rafts. Catamaran style rafts have become popular in the western United States as well, but are typically rowed instead of paddled. Whitewater is formed in a rapid, when a river’s gradient drops enough to form a bubbly, or aerated and unstable current. These days the term has a broader meaning applying to any river or creek that has a significant number of rapids and the term is also used to specify a kind of kayaking, canoeing or rafting on these rivers. 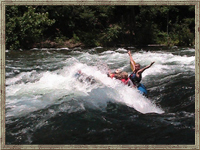 Coming on to whitewater rafting it is a challenging recreational activity using an inflatable raft to navigate a river or other bodies of water. This is usually done on white water or different degrees of rough water, in order to thrill and excite the raft passengers. The development of this activity as a leisure sport has become popular since the mid-1970s. Class I: Easy. Waves small; passages clear; no serious obstacles. Class II: Medium. Rapids of moderate difficulty with passages clear. Requires experience plus suitable outfit and boat. Class III: Difficult. Waves numerous, high, irregular; rocks; eddies; rapids with passages clear though narrow, requiring expertise in maneuvering; scouting usually needed. Requires good operator and boat. Class IV: Very difficult. Long rapids; waves high, irregular; dangerous rocks; boiling eddies; best passages difficult to scout; scouting mandatory first time; powerful and precise maneuvering required. Demands expert boatman and excellent boat and good quality equipment. Class V: Extremely difficult. Exceedingly difficult, long and violent rapids, following each other almost without interruption; riverbed extremely obstructed; big drops; violent current; very steep gradient; close study essential but often difficult. Requires best person, boat, and outfit suited to the situation. All possible precautions must be taken. Class VI (or U) : Formerly classified as unrunable by any craft. This classification has now been redefined as unraftable due to people having recently kayaked mulitple Class VI around the world. You don’t have to be an expert swimmer to be able to experience the thrill of rafting. Especially when there is well equipped, expert team of friendly instructors with you around. You get to experience the sheer power of Ganges in a true adventurer style. A two day rafting expedition at Rishikesh with us would cover about 36 km of the river and you would return all full of the thrills of the rapids. An easy rafting tripcovers about 10-kms of river running. First drive to Brahmpuri, and then take a boat to ride the currents of the water of the Ganges. Raft down through the heart of Lachman Jhula, and Geeta Bhawan to Muni-Ki-Reti and witness the numerous ashrams, yoga and meditation institutes and bathing Ghats with pilgrims taking a holy dip in the Ganges river water. Rafting certainly presents a better way to witness Rishikesh – the town of temples, ashrams and the Ghats and above all only do rafting for thrill. The Camp provides facilities of White Water Rafting covering rapids like Sweet Sixteen (Grade-1), Marine Drive (Grade-2), Three Blind Mice (Grade-3), Cross Fire (Grade-3), Roller Coaster (Grade-4) and Golf Course (Grade-4). 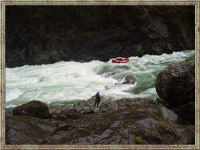 Grade 4 rapids are undertaken depending upon the expertise of the rafter and the decision of the river guide. There are other rapids as well with as exotic names as above – Wall, Daniel’s Dip, Double Trouble, T-Off, Club House, Black Money etc. The best one to start with if you are brave enough. 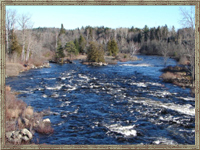 This 16 km stretch involves 7 rapids which includes one Grade IV and one Grade III rapids. Previous rafting experience will help though its not necessary. Kid’s should start with the Brahmapuri Stretch of 9 kms which does not have the Grade IV rapid. Excellent views all around and lots and lots of thrill is guranteed. The Roller Coaster will simply drive you crazy. 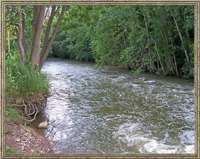 The suitable period for river running depends on the adequacy of water volume. Thus September-November and March-April-May are most appropriate. Most of the river established river camps near the on the Ganges above Rishikesh operate from the end of September to mid-December, and from mid-February until late April. Tour operators even arrange rafting excursions varying in length from one-day runs to extended camping-rafting expeditions, but advanced booking is required. Grade I – Relaxing – Waves are so small you may not even get wet. Grade II – Easy does it – Clear passages and moderate waves. 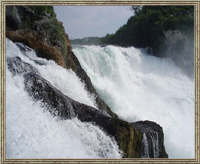 Grade III – Adventurous – Lots of waterslide like waves, rapids with clean passages. Excellent family adventure! 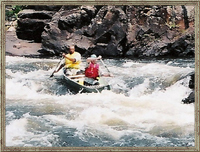 Grade IV – Thrilling – Long rapids, powerful waves. Grade V – Awesome – Long exciting rapids, big technical drops and steep gradient. Grade VI – Don’t try this!! (Grade V and Grade VI rapids are not undertaken for commercial rafting). Sunglasses with straps so that you don’t lose them. Light wool sweater/jacket to wear in camp in the evenings. SEASON: mid Sept to mid December; mid January to end April. Just drop us an enquiry or call 9830788403. This entry was posted on Friday, February 19th, 2010 at 12:02 pm	and is filed under Adventure Tourism, General. You can follow any responses to this entry through the RSS 2.0 feed. You can leave a response, or trackback from your own site. Of course, what a great site and informative posts, I will add backlink – bookmark this site. Good Morning, your webpage design is really cool. I like how all the elements have been placed, and how the page is well structured so that it looks awesome. Hi, i must say excellent blog you’ve, i stumbled across it in Bing. Does you get much traffic? they also provided this type of services. After reading this blog, I honestly think that you have the exact idea of what are you talking about.I really want to applaud you for your passion towards your work that has helped you stand today at this stage.Genuinely,there has not been even a time that I have visited your post and went without getting some good information.Get Going. Great research. And very detailed information sharing. Guys i went for rafting this year with http://www.roofnride.com. Check them out if they can be of help. is most enjoyable river rafting in india. camping, camping in rishikesh and rishikesh rafting camps. 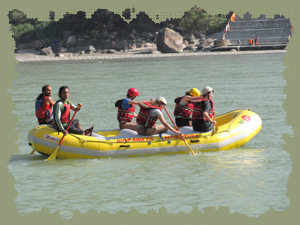 Rishikesh has established itself as the most favored places in India for white water rafting. River Rafting is, undoubtedly, the most exciting adventure sport in India. Any trip to India is incomplete until you get a taste of river rafting in the writhing waters of Ganges. I like the rafting.. I want to go for rafting in rishikesh in next week. It looks like an awesome destination for rafting. Thanks for the information. I love to know more about the place. Rishikesh has established itself as the most favored places in India for white water rafting. River Rafting is, undoubtedly, the most exciting adventure sport in India. Any trip to India is incomplete until you get a taste of river rafting in the writhing waters of Ganges and it is famous place for rafting in rishikesh.